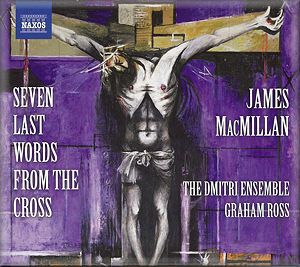 I first encountered James MacMillan’s Seven Last Words from the Cross in 2005 when I attended a very fine performance by a local choir in Gloucester and then, shortly afterwards, reviewed the magnificent Hyperion recording by Polyphony and Stephen Layton. It is, I believe, a masterpiece and it was the work that really opened my ears to MacMillan’s eloquent and challenging music. When I reviewed that Hyperion disc I little imagined that another recording would come along in the foreseeable future. However, here we have one, issued to mark MacMillan’s fiftieth birthday in 2009 and it’s marvellous to be able to report that not only is it an excellent recording but also that, thanks to the enterprise of Naxos, it’s available at budget price. That means that people who don’t know the work and who might be understandably thoughtful about investing in a full price disc can now discover it for a modest outlay. If I may I will refer readers to my review of the Hyperion disc for a fuller description of the work and of its genesis in a 1993 commission by BBC television - a commission that’s all but inconceivable these days, I fear. The music that James MacMillan produced in response to this commission is powerful - often visceral - in its impact and, as so often with this composer, it communicates very directly with the listener. It’s not an easy listen but, having said that, I must emphasise that the musical language is accessible - it’s not just the listener’s ears but, even more so, his or her emotions that are really stretched by MacMillan. Like many other pieces in his output Seven Last Words from the Cross is inspired and underpinned by MacMillan’s Catholic faith. However, it seems to me that one of his great achievements as a composer is to use his faith as a wellspring of inspiration without ever ramming that faith down the listener’s throat. I think it helps to appreciate his religious music if one is a believer but I’m sure that a non-believer can just as validly appreciate the music as a work of art. The Dmitri Ensemble is primarily a string ensemble but other performers, both instrumental and vocal, are added as necessary according to the repertoire that’s being performed. They specialise in performing neglected music and new compositions. In their service to the former category they recently collaborated with Sir David Willcocks to bring us a fine first recording of Vaughan Williams’s Folk Songs of the Four Seasons (see review). Though I was delighted to acquire that Vaughan Williams rarity on disc I think they’ve performed an even greater service to collectors with this MacMillan release. The performance is exceptionally fine. MacMillan makes huge demands on the string players. Sometimes he calls for ardent playing, even for harsh tone, but many passages are subdued, requiring the utmost sensitivity and accuracy of intonation. Though I don’t possess perfect pitch it seems to me that these players meet every challenge in the work and pass every test with flying colours. No less challenged are the singers, and the small choir (7/6/6/6) deliver their demanding parts with skill and commitment in equal measure. Graham Ross draws everything together marvellously; it sounds as if he believes in the music absolutely - as I’m sure is the case. It would be invidious and quite wrong to suggest that this new recording is “better” than the Polyphony disc - or vice versa. Each, it seems to me, is of the highest quality in every respect. Collectors who already have the Polyphony recording can rest content, though given the price of this new issue one could afford the luxury of owning both versions. For a newcomer to this profound score this Naxos disc, with its obvious price advantage, may be the place to start. Happily for those, like me, who want both versions yet need to justify the duplication, the couplings on both discs are different and, in both cases, very attractive. Polyphony offer On the Annunciation of the Blessed Virgin (1997) for five-part choir and organ together with MacMillan’s 2001 setting of the Te Deum. The Dmitri Ensemble gives us three other works. Nemo te Condemnavit is a short Communion motet. In his booklet note MacMillan says it’s one of a growing number of reflective post-Communion pieces that he’s writing for the Catholic liturgy. Here he sets the words of Christ addressed to the woman caught in adultery, as they appear in St. John’s Gospel. It’s a subdued and very beautiful piece. This is its first recording and it receives a performance of the highest quality. ... here in hiding ... is a setting that combines Latin words by St. Thomas Aquinas and a translation of them by Gerard Manley Hopkins. Originally composed for four solo voices and performed and recorded as such by The Hilliard Ensemble, we hear it now in a version for ATTB chorus, which here receives its first recording. I don’t believe I’ve heard the original version but it seems to me that the music is very well suited to the additional richness of texture that a small, expert group of singers can bring to it. It only remains to report that the recorded sound is very good indeed - the producer and engineer is none other than John Rutter - and that the composer contributes a very good note to the booklet, which also includes full texts. Oddly, both the Naxos and the Hyperion discs have one small point of similarity in that both place Seven Last Words from the Cross first on the disc. That’s rather a pity because, as I observed in my earlier review, after the profundities of the main work, which ends so quietly, one just wants a few moments of silence to collect ones thoughts and absorb the listening experience one has just had. But that’s something that can be overcome with judicious use of the remote control. What really counts is that, whichever one of these discs you choose, you have the opportunity to listen to a superb account of one of the most eloquent and moving works of contemporary religious music that I know. I hailed the Polyphony recording of Seven Last Words from the Cross as “an unqualified success”, adding that I recommended the disc “not just enthusiastically but urgently.” This excellent new Naxos release fully justifies equal enthusiasm and I’m delighted to add it to my expanding collection of discs of music by this remarkable composer.